Are you one of those people who complain that after all of those rockets that were sent into space and the moon landings and the shuttle missions, NASA never improved your life? If you have an Apple iPad, the Space Agency is going to prove you wrong. 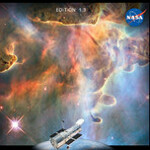 A free eBook available from NASA, entitled Hubble Space Telescope: Discoveries, is full of amazing images and includes videos for you to view including a simulation of a galaxy collision (no, not a Samsung Galaxy collision). The download is fairly large, at 900MB, and you need to have iBooks 3.0 or later and iOS 5.1 or higher. The eBook is highly interactive. Tracy Vogel of the Space Telescope Science Institute in Baltimore, Md., who was part of the design team that worked on the title, said it offers readers the chance to "manipulate a telescope model to see it from all angles, or flip through a gallery of planetary nebulae - all right there on the page." 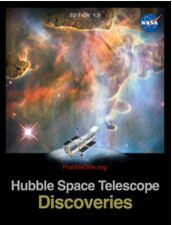 If you have even a slight interest in space or the universe, this eBook will be a good read. And you can't beat the price either. You can download the book for free from the sourcelink. They should make this available on all OS's.